Morris County is a county located in the U.S. state of New Jersey, about 25 mi (40 km) west of New York City. According to the 2010 United States Census, the population was 492,276, up from the 470,212 at the 2000 Census, As of the 2016 Census estimate, the county's population was 498,423, making it the state's 10th-most populous county, and marking a 1.2% increase from 2010. The county is part of the New York Metropolitan Area, and its county seat is Morristown. The most populous place was Parsippany-Troy Hills Township, with 53,238 residents at the time of the 2010 Census, while Rockaway Township, covered 45.55 square miles (118.0 km2), the largest total area of any municipality. After the Wisconsin Glacier melted around 13,000 B.C., Paleo Indians moved into the area from the south in search of big and small game as well as plants. The area was first tundra with grasses growing. Rabbits and fox moved into the area from the south. The Native Americans traded furs and food with the Dutch for various goods. In return the Dutch gave the Native Americans metal pots, knives, guns, axes, and blankets. Trading with the Native Americans occurred until 1643 when a series of wars broke out between the Dutch and Native Americans. There were hostile relations between the Dutch and Native Americans between 1643 and 1660. This prevented colonization by the Dutch of the Morris County region which was technically included in their claimed "New Netherland." 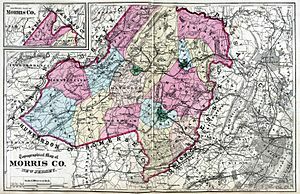 European settlements began in the early 18th century while it was known as Hunterdon County. Native Americans were still in the area at that time. Land was purchased from the Native Americans for various things such as blankets, shirts, rum, guns, knives, pots and gunpowder. The Native Americans' concept of selling land was different than that of the Europeans. Colonization occurred along the Atlantic coast and moved inland. By 1750, nearly all Native Americans had left New Jersey. This was due to land purchases from the Native Americans, diseases that the Native Americans contracted from Europeans, and due to starvation from the Little Ice Age, during which Native American corn crops failed and rivers froze, preventing fishing. Snow storms sent game into semi-hibernation or made them difficult to find. Nut crops such as oak, hickory, beech, walnut, chestnut and butternut failed some years due to late frosts in spring. Due to all the events that happened, Native Americans went to eastern Canada and others went to the Ohio Valley. The Walking Purchase in September 1737, prevented Native Americans from going to eastern Pennsylvania. At that time, European settlement grew swiftly as there was now land to be farmed and settled. 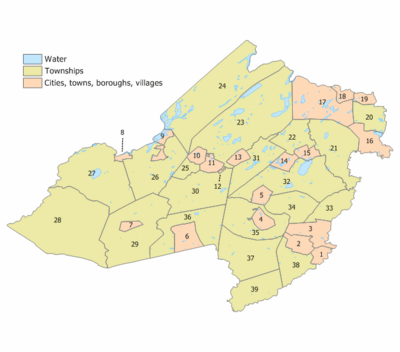 According to the 2010 Census, the county had a total area of 481.62 square miles (1,247.4 km2), including 460.18 square miles (1,191.9 km2) of land (95.5%) and 21.45 square miles (55.6 km2) of water (4.5%). The county is drained by several rivers. The Rockaway River drains 125 square miles (320 km2), of the northern section of the county. The Whippany River drains 69 square miles (180 km2) of the middle of the county. The South Branch of the Raritan River and the Black River drain the western area. 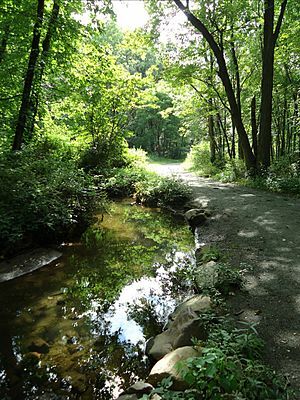 The Loantaka Brook Reservation is a public park with nature, biking, jogging and horse paths, to which 105 acres (42 ha) of land was added as part of a purchase in 2009. Most of the county's borders are rivers. The Pequannock River drains the northern boundary area. The Pompton River drains the eastern section. The Passaic River also drains the eastern border area. The western border is drained by the Musconetcong River. Around 400 million years ago, a small continent long and narrow collided with proto North America. This created folding and faulting, as compression occurred. Then around 350 million years ago, the African plate collided with North America creating the folding and faulting in the Appalachians. But when the African plate pulled away from North America, an aborted rift valley was created. 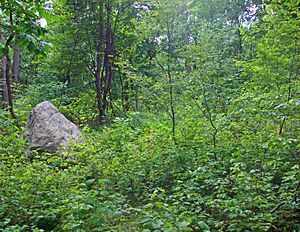 This half graben, starts east of Boonton and goes through the middle of Parsippany, south to Morristown, to the south end of Great Swamp. From Parsippany and the Boonton area the half graben goes east to the western side of Paterson, where there was another fault by the lava flows. East of the Ramapo Fault is where there is this aborted rift valley. The Ramapo fault goes through the county on a northeast–southwest axis. The fault separates the Highlands from the Piedmont, also known as the Newark Basin. This is an active fault. The last major earthquake occurred in 1884, with a strength measured at 5.3 on the Richter scale. Around 21,000 B.C., the Wisconsin Glacier covered about half of Morris County. The terminal moraine went from Hackettstown east to north of Budd Lake, east to Rockaway and Denville, then southeast to Morristown then south to the south end of Great Swamp. When the glacier melted around 13,000 B.C. the melt water created Glacial Lake Passaic. The lake extended from what is now Pompton Lakes through Parsippany south to the south end of Great Swamp. From Parsippany the lake went east to the lava flows of western Paterson. This lake was thirty miles long and ten miles wide (36 km by 12 km). The depth was about 200 feet (61 m). When the Wisconsin glacier cover Morris County the ice sheet was about 300 metres (980 ft) deep. Due to debris from the glacier, the lake was unable to drain through the Watchung Mountains near Short Hills. Instead, it drained through Moggy Hollow at the southwestern end of the lake. But when the glacier melted and receded to the New York State line, the lake drained though the Little Falls area, as this was lower in elevation than Moggy Hollow. And thus the Passaic river formed. In 2009, Forbes magazine ranked the county sixth-best place in the nation to raise a family, the best of any county in the state. The ranking was mainly due to the high graduation rate of 98.4% and employment possibilities from area industry. As of the census of 2010, there were 492,276 people, 180,534 households, and 129,262 families residing in the county. The population density was 1,069.8 per square mile (413.1/km2). There were 189,842 housing units at an average density of 412.5 per square mile (159.3/km2)*. The racial makeup of the county was 82.61% (406,683) White, 3.12% (15,360) Black or African American, 0.16% (805) Native American, 8.95% (44,069) Asian, 0.02% (106) Pacific Islander, 3.03% (14,910) from other races, and 2.10% (10,343) from two or more races. [[Hispanic (U.S. Census)|Hispanic or Latino of any race were 11.47% (56,482) of the population. There were 180,534 households out of which 33.9% had children under the age of 18 living with them, 59.6% were married couples living together, 8.5% had a female householder with no husband present, and 28.4% were non-families. 23.5% of all households were made up of individuals, and 9.5% had someone living alone who was 65 years of age or older. The average household size was 2.68 and the average family size was 3.19. In the county, the population was spread out with 23.9% under the age of 18, 7.1% from 18 to 24, 25.2% from 25 to 44, 30% from 45 to 64, and 13.8% who were 65 years of age or older. The median age was 41.3 years. For every 100 females there were 95.9 males. For every 100 females ages 18 and old there were 93.2 males. At the 2000 United States Census, there were 470,212 people, 169,711 households and 124,907 families residing in the county. The population density was 1,003 per square mile (387/km²). There were 174,379 housing units at an average density of 372 per square mile (144/km²). The racial makeup of the county was 87.20% White, 2.80% Black or African American, 0.12% Native American, 6.26% Asian, 0.04% Pacific Islander, 2.01% from other races, and 1.56% from two or more races. 7.79% of the population were Hispanic or Latino of any race. Among those responding for first ancestry, 22.8% were of Italian, 19.9% Irish, 16.3% German, 8.6% English and 7.5% Polish ancestry according to Census 2000. In 2000, there were 169,711 households of which 35.40% had children under the age of 18 living with them, 62.80% were married couples living together, 7.90% had a female householder with no husband present, and 26.40% were non-families. 21.50% of all households were made up of individuals and 7.30% had someone living alone who was 65 years of age or older. The average household size was 2.72 and the average family size was 3.18. Age distribution was 24.80% under the age of 18, 6.40% from 18 to 24, 31.90% from 25 to 44, 25.30% from 45 to 64, and 11.60% who were 65 years of age or older. The median age was 38 years. For every 100 females there were 95.80 males. For every 100 females age 18 and over, there were 92.70 males. Hispanics constituted a majority of the population in Dover and over a quarter of the people in Morristown; over 18% of Americans in Parsippany-Troy Hills are Asian Americans. There are fairly equal numbers of Irish American and German American residents. The Jewish community is strong in specific areas, such as Randolph, Rockaway, and Morristown. Lincoln Park (26.7%), Montville (26.8%), East Hanover (41.8%), Pequannock Township (29.2%), and Riverdale (33.5%) have significant Italian American populations, along with other northern and eastern communities, while the rest of the county is more mixed with populations of Irish and German ancestries. Wharton (20.8%), Denville (25.1%), and Mine Hill (23.5%) are Irish American. The median income for a household in the county was $77,340, and the median income for a family was $89,773. Males had a median income of $60,165 versus $40,065 for females. The per capita income for the county was $36,964. About 2.4% of families and 3.90% of the population were below the poverty line, including 3.7% of those under age 18 and 5.3% of those age 65 or over. Constitutional officers are County Clerk Ann F. Grossi (Parsippany-Troy Hills Township, 2018), Sheriff Edward V. Rochford (Morris Plains, 2016) and Surrogate John Pecoraro (Mendham Borough, 2019). The county prosecutor is Fredric M. Knapp, who was appointed to the position in December 2012 by Governor Chris Christie. Another organization having the power to affect the county budget without county governmental control is the Morris County Board of Taxation, (also called the Morris County Tax Board). "[T]he freeholders, and county government in general, do not have control over tax board spending. ... [T]he tax board is an entity of state government, even though it submits expense vouchers to county government." Morris County is a part of Vicinage 10 of the New Jersey Superior Court (along with Sussex County), which is seated at the Morris County Courthouse in Morristown; the Assignment Judge for Vicinage 15 is the Honorable Stuart M. Minkowitz. Law enforcement at the county level includes the Morris County Park Police and the Morris County Sheriff. The judicial organization includes the Morris County Prosecutor's Office. The 7th and 11th Congressional Districts cover the county. New Jersey's Seventh Congressional District is represented by Leonard Lance (R, Clinton Township). New Jersey's Eleventh Congressional District is represented by Rodney Frelinghuysen (R, Harding Township). The county is part of the 21st, 24th, 25th, 26th, 27th and 40th Districts in the New Jersey Legislature. For the 2016–2017 session (Senate, General Assembly), the 21st Legislative District of the New Jersey Legislature is represented in the State Senate by Thomas Kean Jr. (R, Westfield) and in the General Assembly by Jon Bramnick (R, Westfield) and Nancy Munoz (R, Summit). For the 2016–2017 session (Senate, General Assembly), the 24th Legislative District of the New Jersey Legislature is represented in the State Senate by Steve Oroho (R, Franklin) and in the General Assembly by Parker Space (R, Wantage Township) and Gail Phoebus (R, Andover Township). For the 2016–2017 session (Senate, General Assembly), the 25th Legislative District of the New Jersey Legislature is represented in the State Senate by Anthony Bucco (R, Boonton Town) and in the General Assembly by Tony Bucco (R, Boonton Township) and Michael Patrick Carroll (R, Morris Township). For the 2016–2017 session (Senate, General Assembly), the 26th Legislative District of the New Jersey Legislature is represented in the State Senate by Joseph Pennacchio (R, Montville) and in the General Assembly by BettyLou DeCroce (R, Parsippany-Troy Hills) and Jay Webber (R, Morris Plains). For the 2016–2017 session (Senate, General Assembly), the 27th Legislative District of the New Jersey Legislature is represented in the State Senate by Richard Codey (D, Roseland) and in the General Assembly by Mila Jasey (D, South Orange) and John F. McKeon (D, West Orange). For the 2016–2017 session (Senate, General Assembly), the 40th Legislative District of the New Jersey Legislature is represented in the State Senate by Kevin J. O'Toole (R, Cedar Grove) and in the General Assembly by David C. Russo (R, Ridgewood) and Kevin J. Rooney (R, Wyckoff). Rooney was sworn into office on December 12, 2016, to fill the seat of Scott Rumana, who had resigned from office on October 20, 2016, to become a judge of the New Jersey Superior Court. As of October 31, 2014, there were a total of 330,014 registered voters in Morris County, of which 113,759 (34.5%) were registered as Republicans, 69,956 (21.2%) were registered as Democrats, and 145,973 (44.2%) were registered as Unaffiliated. There were 326 voters registered to other parties. In the 2008 presidential election, Republican John McCain received 53.3% of the vote here (132,331 cast), ahead of Democrat Barack Obama with 45.2% (112,275 votes) and other candidates with 0.9% (2,310 votes), among the 248,306 ballots cast by the county's 321,254 registered voters, for a turnout of 77.3%. In the 2004 presidential election, Republican George W. Bush received 57.3% of the vote here (135,241 ballots cast), outpolling Democrat John Kerry with 41.6% (98,066 votes) and other candidates with 0.6% (1,847 votes), among the 235,920 ballots cast by the county's 313,745 registered voters, for a turnout percentage of 75.2. In the 2009 gubernatorial election, Republican Chris Christie received 59.5% of the vote here (99,085 ballots cast), ahead of Democrat Jon Corzine with 31.0% (51,586 votes), Independent Chris Daggett with 8.0% (13,321 votes) and other candidates with 0.6% (1,031 votes), among the 166,516 ballots cast by the county's 314,232 registered voters, yielding a 53.0% turnout. Based on IRS data for the 2004 tax year, Morris County had the tenth-highest average federal income tax liability per return in the country. Average tax liability was $15,296, representing 16.3% of Adjusted Gross Income. As of 2010[update], the county had a total of 2,527.39 miles (4,067.44 km) of roadways, of which 2,070.57 miles (3,332.26 km) are maintained by the local municipality, 295.54 miles (475.63 km) by Morris County and 161.28 miles (259.56 km) by the New Jersey Department of Transportation. Morris County is served by several major roadways, including Interstate 80, Interstate 287, Interstate 280, U.S. Route 206, U.S. Route 202, U.S. Route 46, Route 10, Route 24, together with a number of county and local roads. NJ Transit also provides rail service with Morris County via its Morris & Essex Lines and Montclair-Boonton Line to Hoboken Terminal and to New York City via its Midtown Direct service. Rail stations are located in the county providing electrified train service seven days a week from: Chatham, Madison, Convent Station, Morristown, Morris Plains, Denville, and Dover on NJ Transit's Morris & Essex Lines; electrified train service seven days a week from Gillette, Millington and Stirling on the Gladstone Branch; and diesel train service (weekdays only) from Mount Arlington, Lake Hopatcong, Netcong, Mount Olive, Mountain Lakes, Boonton, Towaco (Montville) and Lincoln Park. In recent years, average temperatures in the county seat of Morristown have ranged from a low of 18 °F (−8 °C) in January to a high of 86 °F (30 °C) in July, although a record low of −26 °F (−32 °C) was recorded in February 1934 and a record high of 104 °F (40 °C) was recorded in August 2001. Average monthly precipitation ranged from 2.91 inches (74 mm) in February to 4.89 inches (124 mm) in September. Morris County, New Jersey Facts for Kids. Kiddle Encyclopedia.